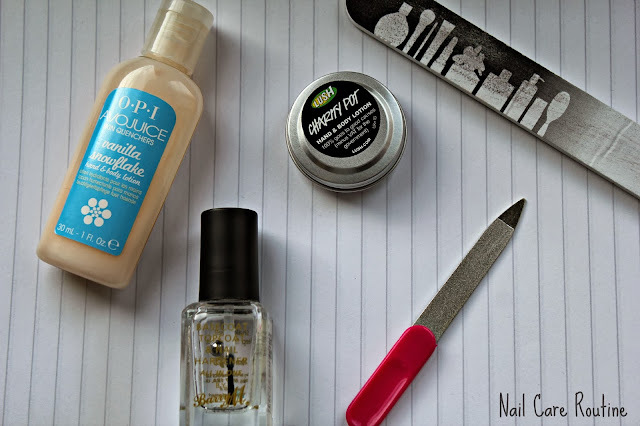 Nail care...something us beauty obsessed (procrastinating) bloggers sometimes forget about. 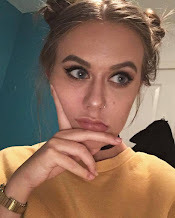 After seeing Anna from ViviannaDoesMakeup talk about her nail care mantra, I thought it was time to sort something out in my world. It isn't very hefty, and I am not sure quite how well it is doing with so little products involved, but it is serving me well for now. Moisturisation. A key part of the process, as looking like there could be boulders falling out of your shriveled, dry fingers isn't a flattering look. Trust me, I've seen it before, and my friend made the comparison, I though it was funny. My little duo of hand creams are the OPI Avojuice Vanilla Snowflake Hand & Body Lotion, and then a mini pot of the Lush Charity Pot Hand & Body Lotion - both of which don't smell the greatest, but do a good job of keeping the hands nourished. All Round Maintenance. So, in my eyes, this is the rest of the process, filing, buffing, base coat, cuticle removing (which I don't actually have to do - lucky me), all that jazz. So, I have 2 nail files that I use, one from Escentual, and the other from a kit I discovered from years ago. Now these both do the job just fine if I want to shorten the length a bit, or round them, or make the square. They are looking a bit worse for wear, so I should really buy some new ones... Then onto a base coat. I don't get all that fancy with this step, as much as I would like the big ol' hefty bottle of OPI Nail Envy; its not something in my budget, so I do just fine with the Barry M Base Coat, Top Coat, and Nail Hardener, mine has seen it's time and is a bit gloopy now, so it looks like a repurchase is on it's way. Got some nice tips from that. My nails are so weak and they seem to break so easily. You're so lucky that you don't have cuticles! i totally don't care about my nails at all. its my most neglected beauty thing. I definitely agree with you on the Lush Charity Pots - they do smell but they keep your hands so moisturized!